I recently read an interesting study: Viewing images that remind you of your home country can decrease your fluency in the foreign language you are learning. The study was done with Chinese students who were living in the US and learning English. When those students were speaking English while viewing pictures that reminded them of China, they produced 11% to 16% fewer words per minute on average. The study also showed that the students tended to use their native language structures and literal translations more often when viewing pictures that reminded them of home. Talk to your friends and use YouTube to find artists you like. Google the lyrics of your favorite songs and get busy translating and understanding the song. Then sing along. Try to imitate the pronunciation of the singer and the flow of the language. This will help you improve your speaking, develop your listening, and learn new vocabulary, including colloquial expressions and slang. To get started, check out this playlist with video lessons using Brazilian songs to teach you Portuguese. There are tons of resources available free online. Visit Street Smart Brazil’s Resources page to find links to podcasts, TV programs, and online radio stations in Portuguese. There you will also find a list of Brazilian musicians with links to YouTube videos. In the book Language is Music, polyglot and language instructor Susanna Zaraysky shares over 70 tips to learn foreign languages fast using music and the media. Follow personalities and make friends who are native speakers of the language you are learning. This will help you use the language in real-life conversations. Don’t worry if your Portuguese is not perfect. Have fun with the experience and enjoy these interactions. May we suggest you start by following Street Smart Brazil on Facebook and Twitter? We hope to speak with you there. Having regular practice is key to achieving and maintaining fluency. Use Meetup.com to find conversation and cultural groups in the target language or create your own group. If you are in the San Francisco Bay Area, please visit our Brazilian Portuguese Meetup group. Another great way to enjoy regular practice is to enroll in a conversation class. It will help you develop fluency around a broad range of conversation topics. 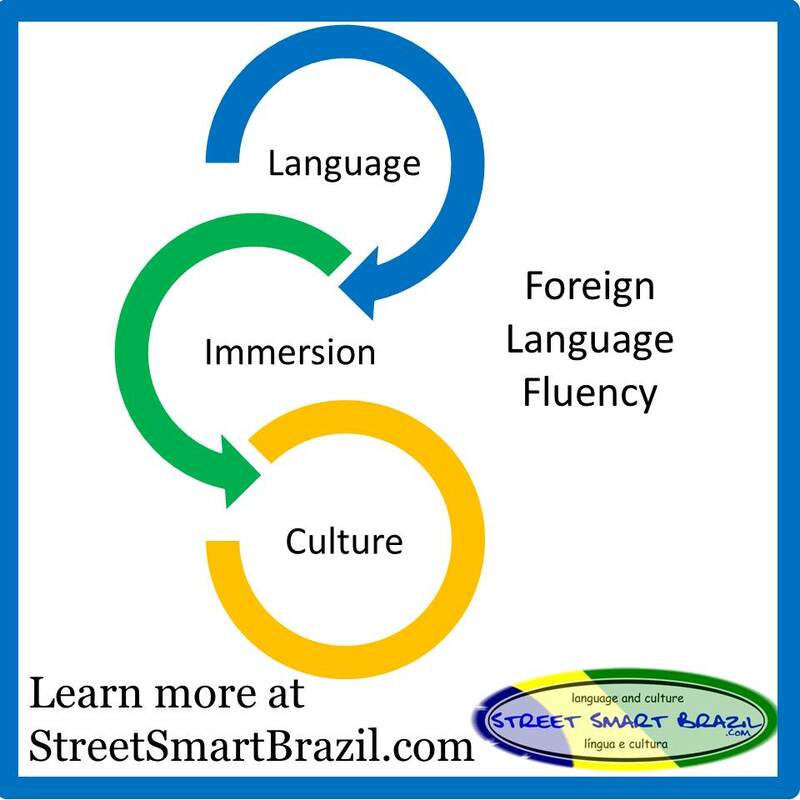 Street Smart Brazil offers online conversation group classes that are designed to help you speak and understand Portuguese better. We’d love to hear from you: How do you create your own immersion at home?